We took delivery of six Quail today! Today we have taken delivery of our little group of Quail and we got our first egg!! How amazing is that? I didn’t expect to see an egg for days yet after their upheaval. In this first picture most of them got the hang of going in and out of the house really quickly but this little one at the side was on for ages trying to work it all out, bless her. We were due to get some last year but with Gary’s broken leg there hasn’t been time or inclination to add to the task list until now. 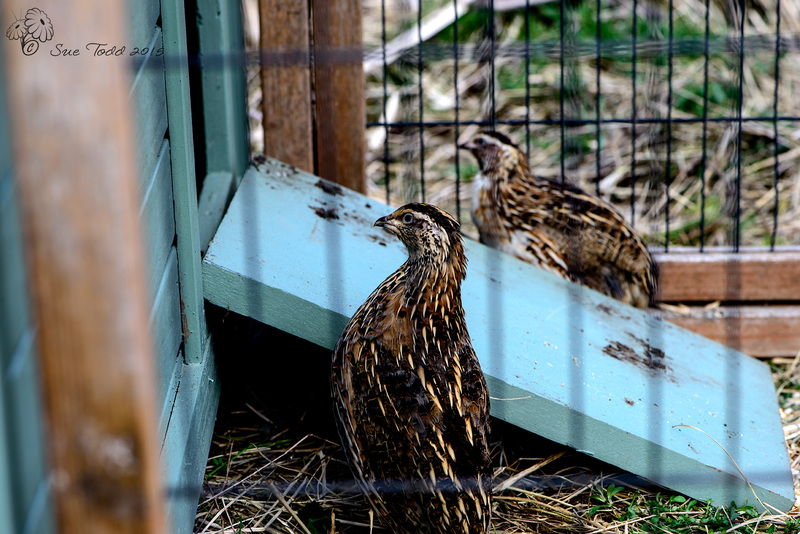 We have five hens and a cockerel so in time we may even have little Quail too! We are settling them into an old hen house and run to start with and while we worried it may have been too large, actually I think it will work a treat. They are extremely timid little things and startle very easily, so when both spaniels escaped this afternoon I was very worried. However the spaniels made a beeline for the wood and totally missed the Quail – phew! Quail © Sue Todd 2015. 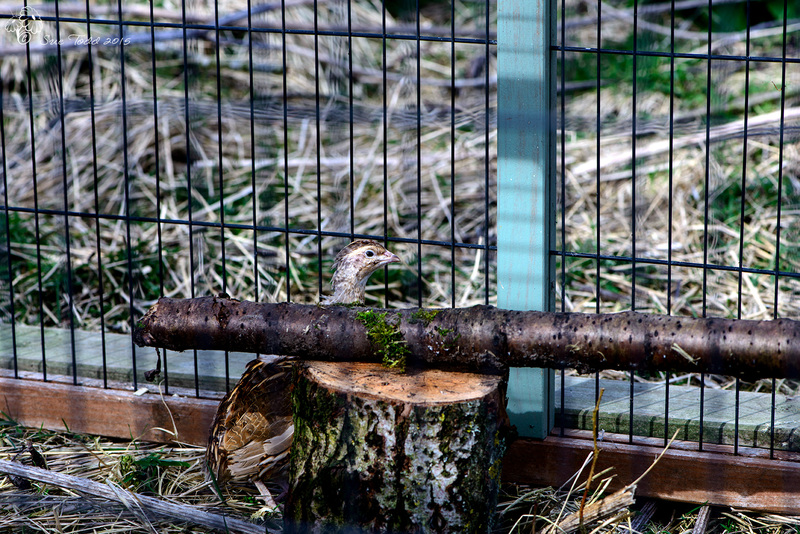 We had to add planks of wood all round the outside of the pen and underneath the house as they are quite nimble and within seconds of being in their run one of them had made her way under the house. Luckily we got her back and they are all safely installed now. We had to re-assemble the run today, of course that took longer than we could have dreamt of, and we did manage to connect the wrong parts to start with doh! I’m rather excited by their arrival and I’m looking forward to more Quail’s eggs coming into the kitchen. 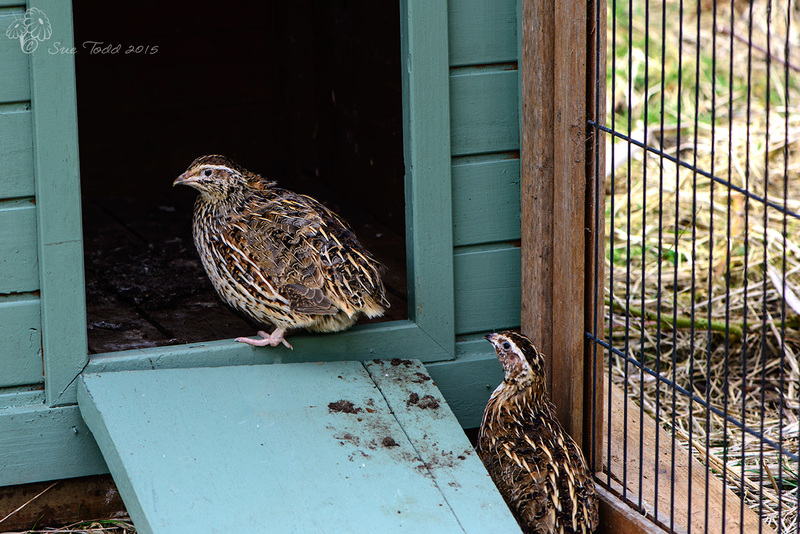 I suspect posts this month may be rather Quail based … Sorry. This entry was posted in Gardening, Quail and tagged Quail on April 2, 2015 by Sue Todd.